Last Saturday night Paul, Stuart and I went to see Discreet + Oblique (part of Transcender) at the Barbican Hall in the glitzy Brutalist Barbican Centre. 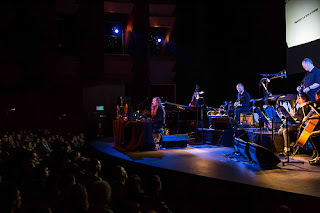 Discreet + Oblique was a 40th anniversary celebration (and somewhat recreation) of Brian Eno's 1970 seminal work Discreet Music by musical directors Leo Abrahams and David Coulter who had devised a richly-imaginative live performance of this breathtaking work. Brian Eno's concept of ambient music builds upon a concept composer Erik Satie called furniture music. This means music that is intended to blend into the ambient atmosphere of the room rather than be directly focused upon. The inspiration for this album began when Eno was left bed-ridden in a hospital by a car accident and was given an album of eighteenth-century harp music. After struggling to put the record on the turntable and returning to bed, he realised that the volume was turned down (toward the threshold of inaudibility) but he lacked the strength to get up from the bed again and turn it up. Eno said this experience taught him a new way to perceive music. During the performance I was gripped on a roller-coaster ride of atonal bleeps, ambient noises and pregnant silences. Others in the auditorium nodded off to sleep. And I would say both are equally valid ways of experiencing the music. At one point Stuart asked me, "you've not got this at home have you?" I replied, "yes, why? Are you going to tell me to never f**king play it in your presence?!" "No", he said, "I wanted to borrow it. I can use it as a relaxation tape for rehab groups at work - it'll make a nice change from pan pipe music." We are the 801. Beep, beep.